Australopithecine pelvises are far more similar to humans than to those of apes, and shows that they were undoubtedly bipedal. The pelvis of Lucy (A. afarensis), although not shown here, is very similar to that of A. africanus. 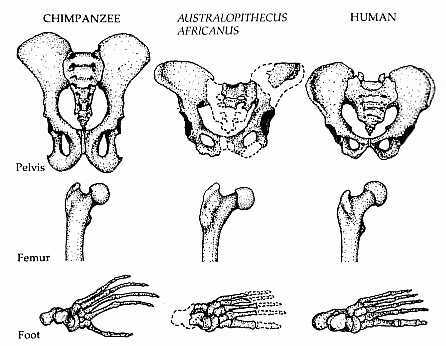 Despite the overall similarity, australopithecine pelvises are not identical to those of humans. There are a number of differences, some of which are more obvious when viewed from other angles.